Windows and doors are the most susceptible part of any structure. If you live in a climate with intense storms, you must take steps to fortify these vulnerabilities against high winds, airborne objects, and flooding. Whether or not you protect your windows can determine if you will have a home or business to come back to after the storm. Window film offers an economical and effective means of storm protection. The storm protection window film adheres to your windows and glass doors with 3M’s famous adhesive technology. The film provides an added layer of invisible protection, which makes your windows more difficult to break. When a window protected by window film is struck by a flying object, the shattered pieces of glass are held together to prevent flying shards of glass. For even greater storm protection, we pair the film with an Impact Protection Attachment System. This prevents the entire window frame from flying inward. 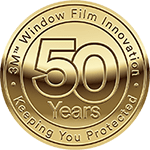 Bolstering your windows with film for storm protection also helps prevent flooding. If a flying object breaks your window, this creates an opening into the interior of your home or business. By holding your windows intact, you keep water out and your possessions safe. Further prevent damage to your windows by removing objects susceptible to becoming airborne from your property. Patio furniture, lawn ornaments, and loose tree limbs all become potential hazards in high winds. Interested in investing in storm protection window film? A window tinting expert from Carolina Solar Security can meet you at your home or business for a free consultation and estimate. After you decide which window film best suits your needs, we set up a time to come back for the installation. Our installers have undergone extensive training with 3M, insuring a flawless result. We apply the film free of bubbles or folds, which makes it virtually invisible. Its inconspicuousness makes it an attractive alternative to plywood or storm shutters. If you feel concerned about the safety of your windows, give Carolina Solar Security a call before the next storm. We’ll help give you peace of mind with storm protection window film. Carolina Solar Security is a Prestige Authorized 3M™ Dealer in Wilmington, NC. We have been providing Southeastern North Carolina with storm protection window tinting solutions since 1985 and never stop working to bring our customers the best products paired with the most skilled window film technicians. Reach out to us for your free quote today!